Prior to choosing Duncan to do the work, I thoroughly researched his company, read all his reviews, and met with him to review the specifics of our project. After completing that, I was very excited about working with this company. The job included a water feature and 4 areas where we were using techo block graphix stone, which is more complicated and technically challenging to install than regular stones. Duncan showed me that he had experience with this type of work by showing me pictures of a job he did last year using techno blocks and told me he knew what he was doing. Based on that experience and his reviews, I hired him to do the work for us. Up front, he told us the job would take 3-4 weeks from start to finish, which seemed reasonable based on other estimates we had received. At our initial meeting, Duncan & I decided to change the original design of the water feature, I showed him a picture of what I would like to have built and he liked the change, agreed to it, and quoted the job based on that new design. Immediately on commencing the work, we realized that the team that Duncan assigned to our job was inexperienced, untrained, unsafe, and unprofessional. We complained EVERYDAY to Duncan about their quality of work, terrible safety practices, and lack of progress. We also regularly reviewed quality, safety, and lack of progress of the work, but Duncan refused to give us another team. It was obvious that the foreman had never run a job before and had never worked with the techo block product. One wall had to be rebuilt 4 times and there was a lot of wasted material and time due to lack of knowledge, not asking for guidance, and bullheadedness of his team. Our biggest frustration was that Duncan chose to continue to try to work with that team to do our work even though things were going sideways and we requested a change, even if it ended up delaying the completion. In addition to the horrible experience with the crew he had working for us, we also found out as we went that he had never built a water feature like the one he quoted for us before. As a result, hadn't factored in several factors which resulted in him underbidding for the cost of the water feature. That was not the only area he ended up claiming that he underbid. He also came back and requested additional money to complete the electrical work needed for the landscape lights and water feature. In addition, his inexperienced foreman removed way too much soil and ripped out all the existing sprinkler system. So at the end of the job, which was an awful experience, Duncan came back to us with a new bill with a lot of extra charges. Some were reasonable, like adding a valve to the sprinkler system, but many were for things he could have and should have known up front and factored into his quote or the result of issues with his inexperience crew. After 7 stressful weeks & continual mistakes and rework, Duncan finally fired the foreman & completed the job himself. The end result was 9 exasperating weeks. Needless to say I would NEVER recommend this company to anyone. While we acknowledge this project had a number of unforeseen challenges, Rockyview Projects did its utmost to bring it to the clients satisfaction with a quality completion. The landscape work and water feature are posted on social media in a positive light from both the client, clients friends and the clients landscape designer. As the client states, our company's reputation stood up to her rigorous research during the selection process. While we can never guarantee a project will run without complications (e.g. Our Skidsteer got vandalized on site, weather, delays in product shipment) we do pride ourselves on going above and beyond to work through all problems and unforeseen setbacks in a professional manner. Our owner personally took on full time leadership on the project to ensure client satisfaction to completion. The client, at the time of completion August 2017, was happy with the project and paid for our services as agreed. James is pleasant, honest, easy to work with & knowledgeable. Does a great job and leaves the area clean when the job is completed. I would and have recommended him to family and friends. Thanks. Always a pleasure dealing with you over the years! Michelle was very professional and nice. She listened to what I had to say then add excellent suggestions and ideas. She was able to capture my vision for an outstanding yard. I would highly recommend Aris Landscape Design. Eisses window cleaners has been cleaning my windows for 5 years. I have recommended this company to many family and friends. They consistently do a great job. Even though our renovations were running behind Fabian was very accommodating and easy to work with. His painting crew was wonderful and extremely hard working. Since we were behind and our shipment was coming I asked Fabian if he could paint the whole house (3600 sq ft) in a week not 2 weeks. He just said "OK we will just work a little longer". That's exactly what they did, then after we moved in they came back and did the touch up. I will only use Fabian for all my painting needs. I needed tile for 2 bathroom floors and showers, back splash in kitchen and boot room floor. I had no idea what I was looking for but Twyla came to my rescue. She took her time I never felt rushed, she had lots of great ideas and was so easy to work with. I will only go to USI for my tiling needs and will recommend this company to my family and friends. We purchased our new carpet and exercise floor from Mint. You can get carpet anywhere but the service we received from Noel was incredible. He came to the house several times to make sure the seams would look great. He also shared him great designing advice with me. During install Noel showed up late at night to see how the project was progressing. When we develop our basement Mint (& Noel) will be our only stop. Replaced 4 windowed and installed 5 mirrors and 2 shower doors. 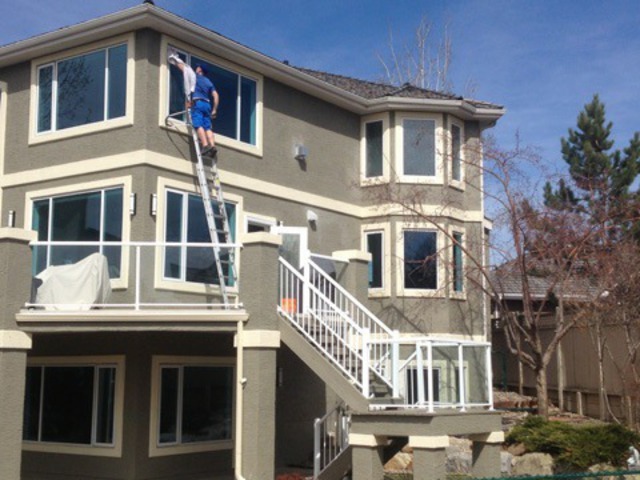 After the windows were replaced the stucco needed to be repair which I was told up front. The stucco repair guy said the Chinook glass did a great job of cutting the stucco and only cut what they needed in order to get the new glass installed. Jim from Chinook glass measure all the above items perfectly and was so great to work with. I needed the bathroom windows installed so I could get the shower tiled. I was told 6-8 weeks before they could install them. I called Poppy from Chinook Glass explained how far behind that would put my renos and she got the glass installed in 3 weeks. Then I really wanted the shower doors before Christmas and Chinook glass made it happen. While installing the mirrors one mirror was cut wrong. The installer took it back to the shop and had it installed within hours. What nice people that work at this company and what great customer service. This company installed gutters on our raised deck. They had some issues with the angles but worked really hard at getting it right. The only complaint I have is that when I called I frequently got an answering machine and they generally don't call back but just show up to do the work. I will use this company again and would recommend them to my family and friends. Renovated a house and decided to replace the front and back doors and a window that had the glass bricks in it. I had two other companies come out and I was very unimpressed with their prices and products. Suzanne from Lux came in and was incredible, she had great suggestion and I loved the products. Since we had a lot of work going on in the house I found Erin from Lux extremely accommodating and great to work with. The installer were very nice, worked very hard and cleaned up after they were done. The end result was, a beautiful front door that my neighbors, family and friends commented on. I need a new window upstairs and a new basement door, Lux windows and doors will be my only call this time. Working with Mikaela from California Closets was one of the few highlight during our renovation process. She was very professional, nice, extremely hard working, attention to detail and really listened to what I had to say. She obsessed about every little detail along the way. The end result was an incredible, perfectly organized closet and boot room. Excellent quality product, great installers who were so nice, cleaned up after themselves and did a great job installing. I would highly recommend California Closets to my family and friends. From the moment I walked into the store the receptionist Amanda made me felt like a valued customer. This company is going to do whatever it takes to make me happy. Walt was very personable and works really hard to make sure you get the best piece of granite and you are 100% happy. My husband and I showed up on a Saturday hoping to just see our granite. Walt took us on a tour of the plant and showed us how they leather, template and cut the granite. The plant tour was very interesting and you can tell Walt loves to show his customers around. When it came time to template the granite Neil made sure there was very little wasted granite. The installer (Kevin & Tyson) worked very hard to make sure the granite was laid perfectly. I will be developing my basement soon and I can't wait to go back to The Granite Guys. Westridge was the most stressful part of our renovations, I have recommended that family and friends NOT use them. It didn't take 1 week to receive the drawings but 3 weeks. Even though two people measured the area we picked up several wrong measurements in the plans and the sales associate Megan didn't seem to be that concerned about it. I called Megan's boss Steen to complain and that was another huge mistake. When our product came in we had pieces that weren't ours, wrong size, over-sprayed, marked up and several missing pieces. I tried to call Megan but she wouldn't take my calls so I emailed her and cc'd Steen and finally got a response. We had so many problems Stephen from Red Deer came down and promised I would have the pieces I needed for the granite install, the pieces didn't come. When the new pieces arrived we had missing pieces, wrong sizes, over-sprayed and damaged pieces yet again. Finally we got everything installed and they sent Sean to repair the damage, he did a great job. He was was only reason I gave Westridge a one star rating and not a zero. I would recommend not giving them all the money before you inspect your produce. We so are so sorry to hear about your experience with our company. We have recently included a digital customer service program to our business which is why we are reaching out to you now rather than a year ago when you submitted this review. We apologize for the delay. Can you please reach out to calgary@westridgecabinets.com, we would like to know more about your experience so we can learn from it and ensure that our customer service is reflected of todays quality service standards, you can see this reflected in our more recent reviews. We hope that you take the time to reach out we really do look forward to learning more. They used my preexisting security system and didn't try to talk me into things that I didn't use or need. All the staff that I have dealt with were extremely friendly, helpful and courteous. I will always use SafeTech. Always working for your best interest. Let us know if you need anything in the future.